Peleg Field, New Berlin’s first blacksmith, moved to the area in 1796. The Field Blacksmith Shop served the community of New Berlin, New York, from 1827 until the 1850’s. Since two other blacksmiths had set up shop in New Berlin by 1827, this building may have been Field’s attempt to stay ahead of his new competition. 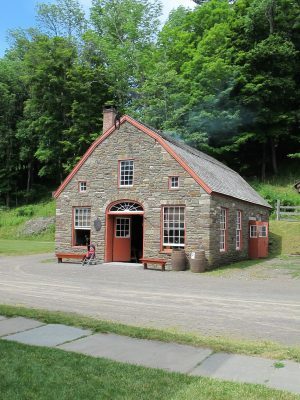 The building is unique because it has two forges, is much larger than typical blacksmith shops, and has interesting architectural features. Blacksmiths work with iron and steel to create a variety of goods. 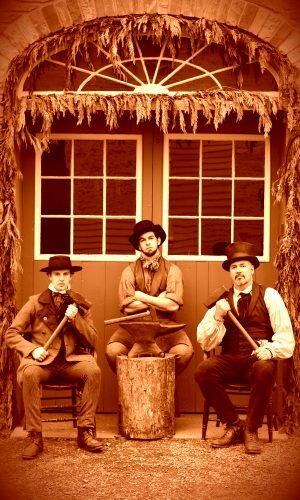 As skilled craftspeople in the 1800’s, blacksmiths provided important services to growing communities. Rural blacksmiths were able to work on a number of different types of smithing. The more diverse a rural blacksmith’s skill, the more valuable he was to the community. They mostly focused on making and repairing farm equipment, shoeing horses, making kitchen utensils, and working on hardware for vehicles. The community would depend on the blacksmith to manufacture and repair most of the hardware that families used every day. 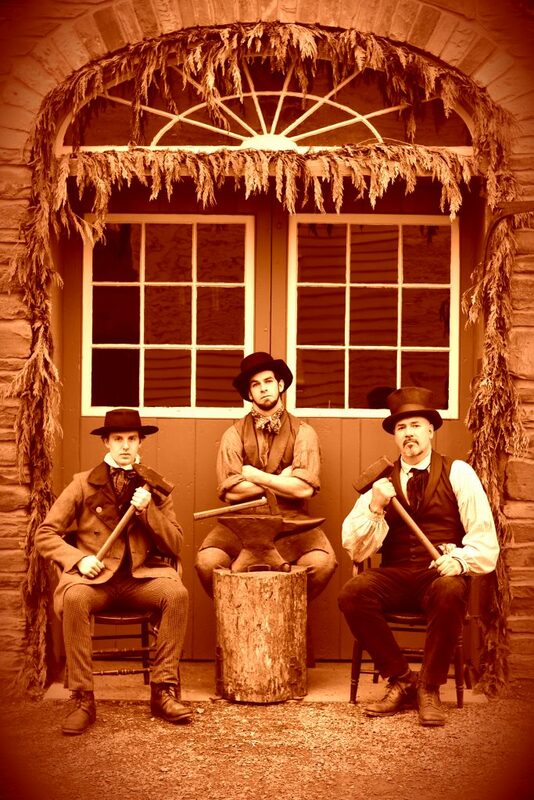 The blacksmiths at the Farmers' Museum are highly trained artisans; here the pose for a replica of a nineteenth century photograph. A blacksmith would keep accounts of his work. In his day book, he would keep track of what he did that day. He would also keep an account book to track the debits and credits of his customers. Customers rarely paid the same day that work was done. Payment could either be cash, goods, or services. The Industrial Revolution in America began to change the job of the rural blacksmith. 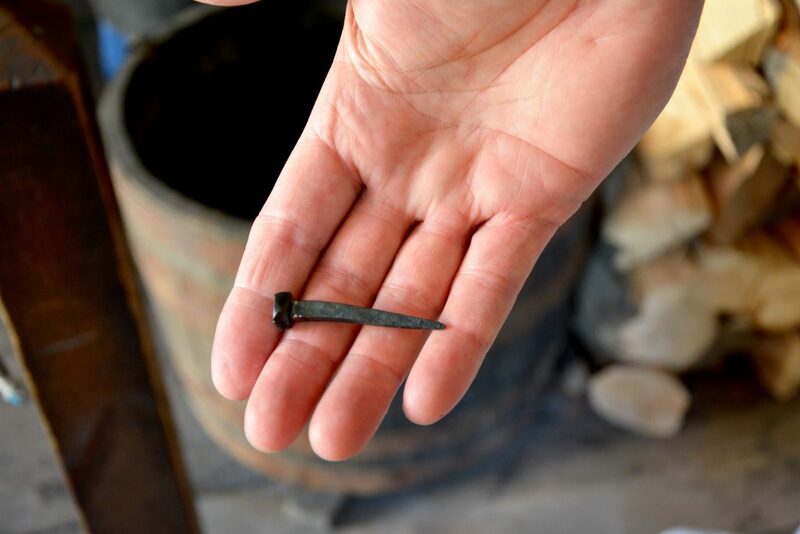 With the mass production of farm equipment and household items, the blacksmith spent less time making items and more time repairing items. Over time, it became cheaper to replace a broken item than have the blacksmith repair it. With the increase in the number and quality of roads, more people were having their animals shod. Slowly, the role of the blacksmith changed to someone who mostly shoed horses. The blacksmith shop would need to contain a forge, bellows, tools, iron, and fuel to do the job. The heart of the shop would be the forge and bellows. The forge is where the iron would be heated. The bellows would force concentrated air under a coal or charcoal fire to make it hot enough to work the iron, usually around three thousand degrees. After the metal was heated to around two thousand degrees, it would be moved to the anvil. The surface of the anvil would provide a place to absorb the blows from the hammer, and by using certain parts of the anvil, could help form the shape of the object being forged. It was common for the blacksmith to make a tool specifically for a particular job. The tools used by the blacksmith would fall into several categories with the blacksmith having multiple variations in each type of tool. They would vary in size, weight, and face type to accomplish a particular job. 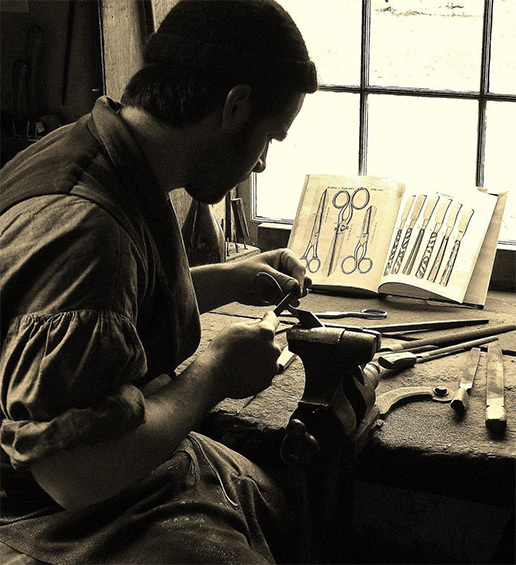 Blacksmiths would use hammers, punches, tongs, forms, chisels, wedges, and fullers. If a blacksmith did not have a perfect tool for a job, he would make it. 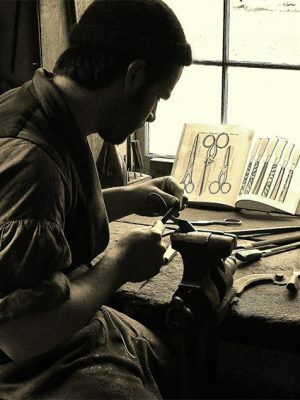 Tools created by a blacksmith for a particular job were often very unique and unrecognizable even to other blacksmiths. 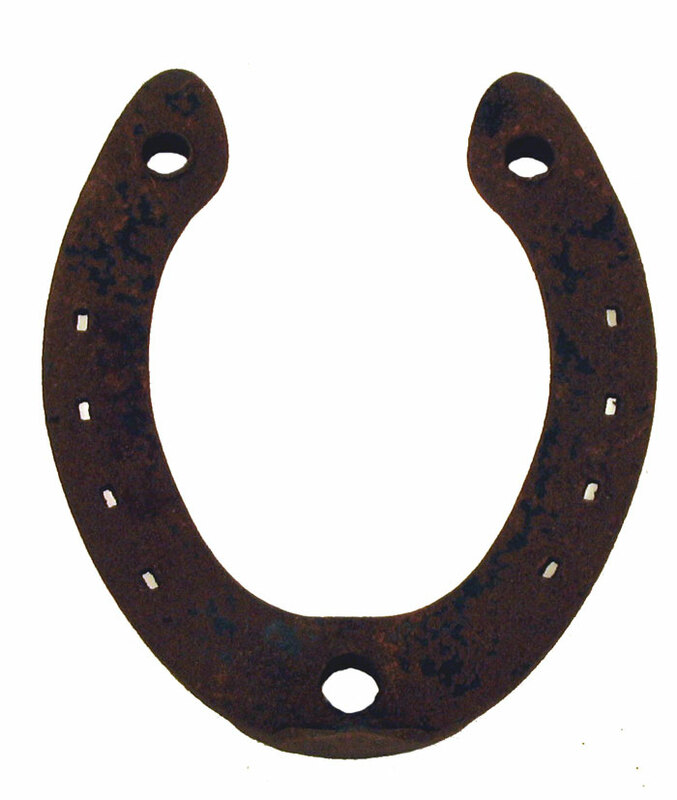 Horseshoes were very common in a blacksmith’s shop. 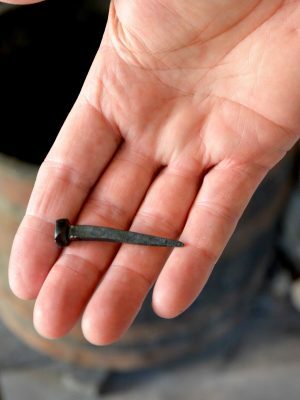 The blacksmith would not only make the shoes by hammering and shaping hot iron, but he would also assist farmers by putting the shoes on their horses. Blacksmiths working in specialized shops made many of the tools that farmers needed to work in their fields. 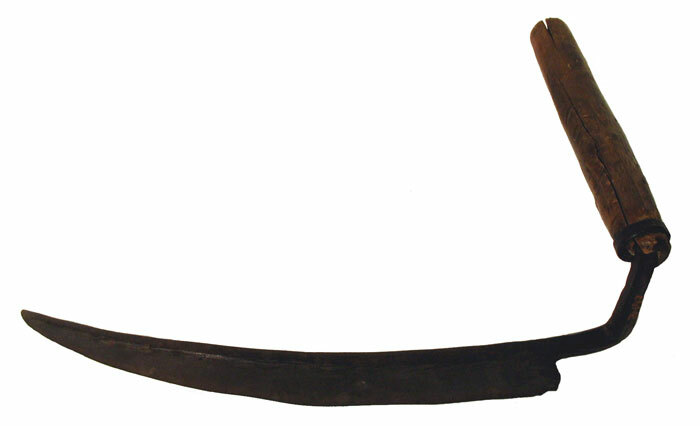 The blade on this large hay knife was made by a blacksmith. 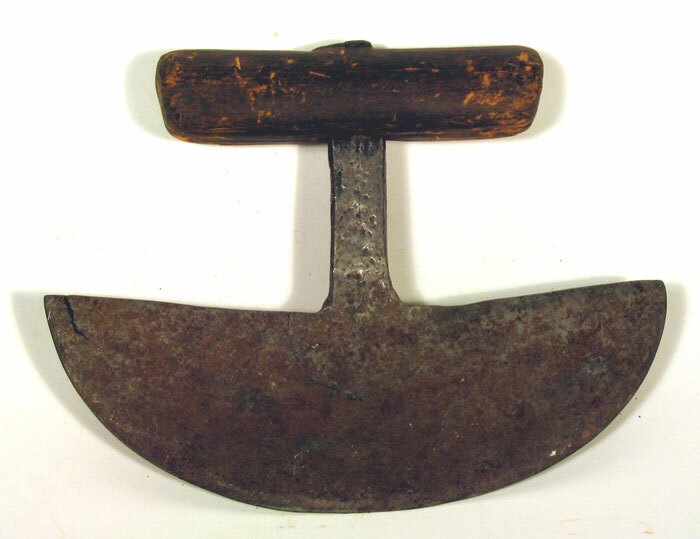 After a wooden handle was added, the farmer used this tool to cut down tall grasses during harvest time.